MiniAir Junior Anemometer Display Unit for Air Flow Monitoring. The MiniAir Junior anemometer is suitable for measuring the velocity of gaseous media. The display provides a reading of flow measurement with 2 selectable intervals, 6 or 22 seconds. Min, max and average readings can be displayed for latest interval. Sets are available with standard micro, mini and macro probes as well as individual displays and probes. 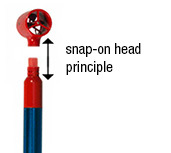 Standard probes use a snap head principle for quick and easy replacement without the need for re-calibration. The standard MiniAir Junior is available as complete kit, with probe, display and carry case. The MiniAir Junior is a portable vane anemometer that is particularly suitable for the heating, air conditioning and ventilation engineer. The MiniAir Junior is a single channel hand held measuring instrument for air flow measurements using a selection of detachable vane anemometers. The vane anemometers come in three different sizes: Micro; Mini; and Macro, with two different flow ranges available for each: 0-20ms; and 0-40m/s. The individual probes include a synthetic plastic construction snap head with a metal turbine that generates a frequency output each time the metal blade passes the probe handle. The frequency of rotation is virtually proportional to the air-flow velocity and largely independent of pressure, temperature, density and humidity. The MiniAir Junior display converts the rotational frequency into a standard signal and shows the measured value in the display. Probes are available with either Aluminium or Steel vane and handles. The Aluminium probes are suitable for non-aggressive gases. Steel probes are available with the MiniAir 20 unit and would be more suited for aggressive environments. Suitable for use with all MiniAir Junior flow sensors. 2 Average value measurement intervals: Fast = 6 Secs, Slow = 22 Secs. Snap head vanes for easy measuring vane replacement, existing calibration retained. Any snap head replacement should be of the same original size and flow range. MiniAir Junior Micro Starter Kit for measuring the velocity of non-corrosive gaseous media. MiniAir Junior 4 digit LCD display, selectable average over 6 or 22 seconds with min, max and average values. Dimensions 80 x 145 x 39mm, operating temperature 0-50°C. MiniAir Junior Micro vane anemometer. Air velocity range 0.6-20m/s with accuracy ±2% of full scale, ±5% of reading. Sensing head 11mm diameter x 15mm, probe length 165mm. Sensor is supplied with 1.8m cable and connector for interfacing with display. Plastic sensing head with Aluminium blade turbine suitable for non-aggressive gas flows. Operating range -30 to +140°C. Kit comes complete with leather carry case. MiniAir Junior Micro Starter Kit for measuring the velocity of non-corrosive gaseous media. MiniAir Junior 4 digit LCD display, selectable average over 6 or 22 seconds with min, max and average values. Dimensions 80 x 145 x 39mm, operating temperature 0-50°C. MiniAir Junior Micro vane anemometer. Air velocity range 0.7-40m/s with accuracy ±2% of full scale, ±5% of reading. Sensing head 11mm diameter x 15mm, probe length 165mm. Sensor is supplied with 1.8m cable and connector for interfacing with display. Plastic sensing head with Aluminium blade turbine suitable for non-aggressive gas flows. Operating range -30 to +140°C. Kit comes complete with leather carry case. MiniAir Junior Mini Starter Kit for measuring the velocity of non-corrosive gaseous media. MiniAir Junior 4 digit LCD display, selectable average over 6 or 22 seconds with min, max and average values. Dimensions 80 x 145 x 39mm, operating temperature 0-50°C. MiniAir Junior Mini vane anemometer. Air velocity range 0.4-20m/s with accuracy ±1% of full scale, ±3% of reading. Sensing head 22mm diameter x 28mm, probe length 175mm. Sensor is supplied with 1.8m cable and connector for interfacing with display. Plastic sensing head with Aluminium blade turbine suitable for non-aggressive gas flows. Operating range -30 to +140°C. Kit comes complete with leather carry case. MiniAir Junior Mini Starter Kit for measuring the velocity of non-corrosive gaseous media. MiniAir Junior 4 digit LCD display, selectable average over 6 or 22 seconds with min, max and average values. Dimensions 80 x 145 x 39mm, operating temperature 0-50°C. MiniAir Junior Mini vane anemometer. Air velocity range 0.5-40m/s with accuracy ±1% of full scale, ±3% of reading. Sensing head 22mm diameter x 28mm, probe length 175mm. Sensor is supplied with 1.8m cable and connector for interfacing with display. Plastic sensing head with Aluminium blade turbine suitable for non-aggressive gas flows. Operating range -30 to +140°C. Kit comes complete with leather carry case. MiniAir Junior Anemometer Display Unit. Single channel hand-held air flow monitoring unit with 4 Digit LCD display showing min, max and average flow velocity (selectable 6 or 22 sec averaging). Internal 9V LR22 battery suitable for up to 12 hours operation. IP40 explosion protected housing. Dimensions: 80 x 145 x 39mm, weight 230g. Operating temp: 0 to 50°C. MiniAir20 Micro vane anemometer. Air velocity range 0.6-20m/s with accuracy ±2% of full scale, ±5% of reading. Sensing head 11mm diameter x 15mm, probe length 165mm. Sensor is supplied with 1.8m cable and connector for interfacing with MiniAir Junior display. Plastic sensing head with Aluminium blade turbine suitable for non-aggressive gas flows. Operating range up to 140°C. MiniAir20 Micro vane anemometer. Air velocity range 0.7-40m/s with accuracy ±2% of full scale, ±5% of reading. Sensing head 11mm diameter x 15mm, probe length 165mm. Sensor is supplied with 1.8m cable and connector for interfacing with MiniAir Junior display. Plastic sensing head with Aluminium blade turbine suitable for non-aggressive gas flows. Operating range up to 140°C. MiniAir20 Mini vane anemometer. Air velocity range 0.4-20m/s with accuracy ±1% of full scale, ±3% of reading. Sensing head 22mm diameter x 28mm, probe length 175mm. Sensor is supplied with 1.8m cable and connector for interfacing with MiniAir Junior display. Plastic sensing head with Aluminium blade turbine suitable for non-aggressive gas flows. Operating range up to 140°C. MiniAir20 Mini vane anemometer. Air velocity range 0.5-40m/s with accuracy ±1% of full scale, ±3% of reading. Sensing head 22mm diameter x 28mm, probe length 175mm. Sensor is supplied with 1.8m cable and connector for interfacing with MiniAir Junior display. Plastic sensing head with Aluminium blade turbine suitable for non-aggressive gas flows. Operating range up to 140°C. MiniAir20 Macro vane anemometer. Air velocity range 0.3-20m/s with accuracy ±1% of full scale, ±3% of reading. Sensing head 85mm diameter x 80mm, probe length 225mm. Sensor is supplied with 1.8m cable and connector for interfacing with MiniAir Junior display. Plastic sensing head with Aluminium blade turbine suitable for non-aggressive gas flows. Operating range up to 140°C. MiniAir20 Macro vane anemometer. Air velocity range 0.4-40m/s with accuracy ±1% of full scale, ±3% of reading. Sensing head 85mm diameter x 80mm, probe length 225mm. Sensor is supplied with 1.8m cable and connector for interfacing with MiniAir Junior display. Plastic sensing head with Aluminium blade turbine suitable for non-aggressive gas flows. Operating range up to 140°C. Replacement MiniAir Junior Micro snap head with an air velocity range of 20 m/s with an Aluminium turbine. Sensing head 11mm diameter x 15mm. This snap head may be used with the MiniAirJunior anemometer probe, Part Ref: MINIJU212 or MiniAirJuniorEx Anemometer probe, Part Ref MIEXJU2112. Replacement MiniAir Junior Micro snap head with an air velocity range of 40 m/s with an Aluminium turbine. Sensing head 11mm diameter x 15mm. This snap head may be used with the MiniAirJunior anemometer probe, Part Ref: MINIJU214 or MiniAirJuniorEx Anemometer probe, Part Ref MIEXJU2114. Replacement MiniAir Junior Mini snap head with an air velocity range of 20 m/s with an Aluminium turbine. Sensing head 22mm diameter x 28mm. This snap head may be used with the MiniAirJunior anemometer probe, Part Ref: MINIJU222 or MiniAirJuniorEx Anemometer probe, Part Ref MIEXJU2122. Replacement MiniAir Junior Mini snap head with an air velocity range of 40 m/s with an Aluminium turbine. Sensing head 22mm diameter x 28mm. This snap head may be used with the MiniAirJunior anemometer probe, Part Ref: MINIJU224 or MiniAirJuniorEx Anemometer probe, Part Ref MIEXJU2124. Replacement MiniAir Junior Macro snap head with an air velocity range of 20 m/s with an Aluminium turbine. Sensing head 85mm diameter x 80mm. This snap head may be used with the MiniAirJunior anemometer probe, Part Ref: MINIJU232 or MiniAirJuniorEx Anemometer probe, Part Ref MIEXJU2132. Replacement MiniAir Junior Macro snap head with an air velocity range of 40 m/s with an Aluminium turbine. Sensing head 85mm diameter x 80mm. This snap head may be used with the MiniAirJunior anemometer probe, Part Ref: MINIJU234 or MiniAirJuniorEx Anemometer probe, Part Ref MIEXJU2134. Replacement MiniAir Junior Mini snap head with an air velocity range of 20 m/s with a synthetic plastic construction snap head with a Steel vane. Sensing head 22mm diameter x 28mm. This snap head may be used with the MiniAirJuniorEx Anemometer probe, Part Ref MIEXJU2252. Replacement MiniAir Junior Mini snap head with an air velocity range of 40 m/s with a synthetic plastic construction snap head with a Steel vane. Sensing head 22mm diameter x 28mm. This snap head may be used with the MiniAirJuniorEx Anemometer probe, Part Ref MIEXJU2254. Replacement MiniAir Junior Macro snap head with an air velocity range of 20 m/s with a synthetic plastic construction snap head with a Steel vane. Sensing head 85mm diameter x 80mm. This snap head may be used with the MiniAirJuniorEx Anemometer probe, Part Ref MIEXJU2262. Replacement MiniAir Junior Macro snap head with an air velocity range of 40 m/s with a synthetic plastic construction snap head with a Steel vane. Sensing head 85mm diameter x 80mm. This snap head may be used with the MiniAirJuniorEx Anemometer probe, Part Ref MIEXJU2264.